I have been using DAV to copy images (typically png screen snaps, or jpeg photos) to a plone site for inclusion in articles. This allows multiple images very quickly into a folder. However, I have found that the DAV client is uploading them with a mime type 'application/octet-stream', and they end up being of type 'file' in plone (they should be of type 'image' with a mime type of 'image/jpeg') [Note: this can be viewed in the ZMI by adding '/manage_main' to the end of the image URL]. When linking to those images within an article, the web browser doesn't show them correctly (and instead shows a save as file dialog). This article is based on the collective uploadify instructions. 'easy_install' is part of the python-setuptools rpm package. WARNING: This product doesn't support copying the package into '/var/lib/zope/Products'. To use the product, add '/@@upload' to any folder. i.e. go to http://your-plone-site/any-old-folder/@@upload. Use the 'browse' button to select one or more files. Then use the 'upload files' button to commit them. At this stage the upload is functional, but not very convienent. Use the ZMI to add an 'Upload' portal action. 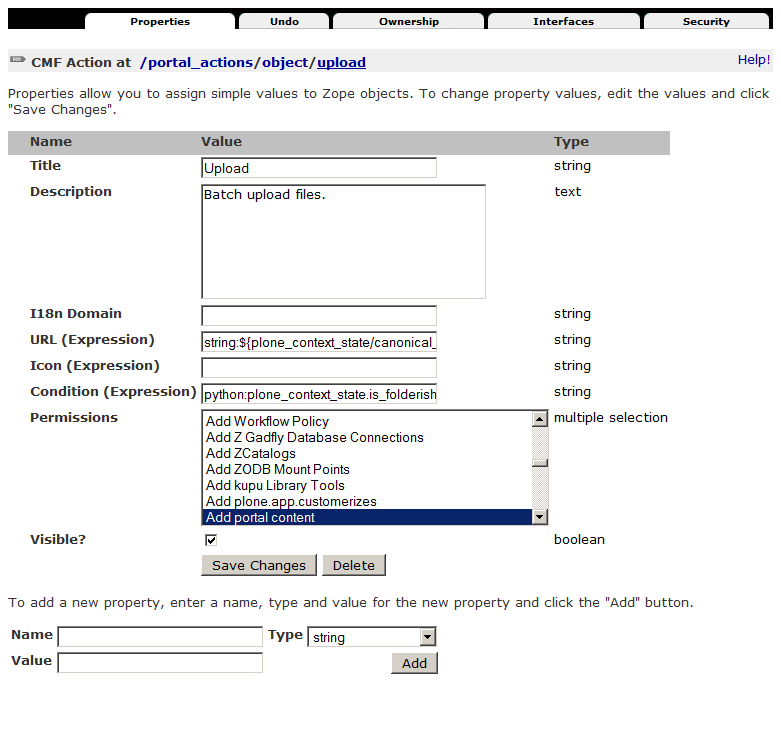 Browse to http://<plone.site>/portal_actions/object and press the 'Add' button to add a new CMF Action. 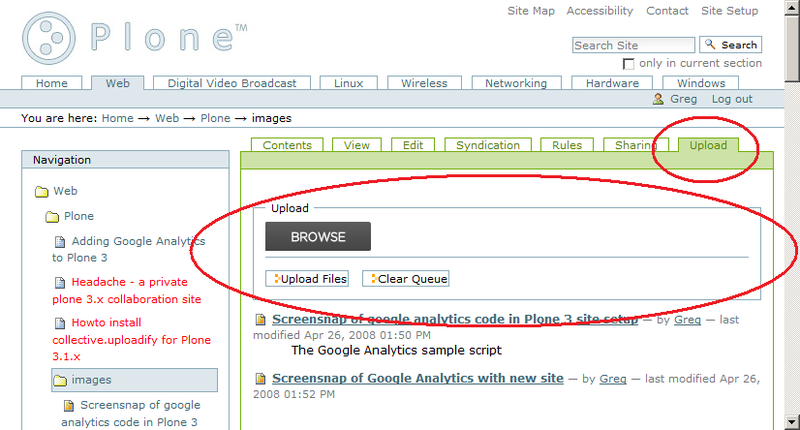 Now the plone site should have a new 'Upload' tab on folders, where the user can add portal content. When no files have been selected for upload the control will be empty. Press the 'BROWSE' button to multi-selct files for upload. Once files have been selected, they will appear in a list between the 'BROWSE' button, and the 'Upload files' button.